outreach | Have YOU Ben Starr Struck? For the next installment of my MasterChef: Where Are They Now? series, I’ve chosen one of my personal favorites from Season 2…Tracy Kontos. Tracy is one of those people that, upon meeting, you instantly feel like you’ve been bosom buddies for decades. She immediately sweeps you into this comfortable familiarity and makes you feel like the most important person in the world. 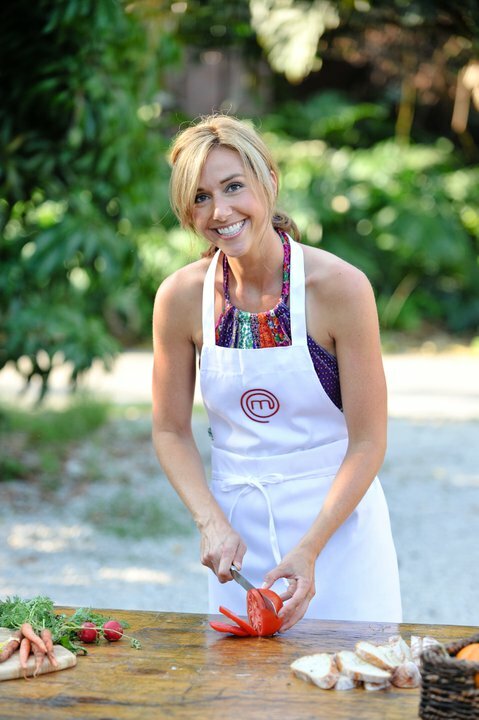 Tracy’s MasterChef journey began in southern Florida, where she lived with her then-husband, a private pilot for a mega-celebrity. Tracy met her husband when she was a private flight attendant for said celebrity, in a time when her life was very spontaneous and free, exploring the world, following her heart and her dreams. After getting married, she applied her rare people skills to a sales position with a major multi-national company and, in no time, she was a national sales manager, making big bucks, wheeling and dealing with Maserati-driving big-wig executives twice her age. She and her husband settled down with a white picket fence and contemplated a family. But something was missing. The siren song of her beloved kitchen led her to a MasterChef audition, and in no time she was sitting next to me in a grimy warehouse in Compton filming the signature dish challenge. Smooth sailing right through to the big challenge that would decide the top 18, when her chicken skin cracklins caught fire in the oven and Ramsay really noticed her for the first time. But certainly not the last. Tracy is one of those people who is magnetic…when she’s in the room, you can’t help but gravitate toward her. Tracy did well and went far, but not as far as most of us thought. (We all considered her a definite candidate for the win, and I think the judges did, too. Of course…neither the contestants nor the judges have any say over who the winner will be!) And being on the show affected Tracy more deeply than most of us. She didn’t return home immediately after the show finished filming. She went on a tour of the country, interning in some of the best restaurants (including Graham’s and Joe’s), getting to know what being a chef is REALLY like. Because, on MasterChef, it’s just a bizarre hybrid of celebrity and slavery. Upon returning to southern Florida to her husband, her dogs, and her white picket fence, Tracy discovered that she had no job. Because when you leave to be on MasterChef, you have to tell your employer, “I’m going away for an unspecified amount of time…it could be a week, or it could be two months. I can’t tell you what I’m doing, and I won’t be able to contact you during that time. So I’ll see you when I get back.” A major corporation can’t really deal without one of its top national sales executives for 2 months, so Tracy was replaced while she was in LA filming the show. The loss of a job is no big deal for a woman like Tracy. She could walk into the corporate headquarters of ANY major company in this country and have a corner office that afternoon. She’s that kinda person. But she looked around her home…she looked at her marriage…and she realized that her life had gotten derailed somewhere back along the line. She had lost her creative spirit…her drive to explore life on her own terms…and she walked away from her husband and her beloved pups, packed up a suitcase, and drove to Los Angeles. With a stop at my house along the way, of course, to make sure she was doing the right thing. Understandably, the only person who could answer that question was her, and I told her as much. But having her in my kitchen, cooking casually without Ramsay’s firey breath on our necks, was a moment I’ll remember all my life. She was scared. But she was excited. Because she had lost track of who she really was during the past few years, and MasterChef had been a brutal wakeup call. Tracy landed in LA with no job, and she started at the bottom, in the place where most people start: waiting tables. A scant few months ago she was sitting in her corner office in her suit, commanding a sales force. And now she was slinging cocktails and burgers at a beach bar. Tracy started a catering company with Alejandra Schrader from our season, which began developing her connections in the LA food scene. Soon after, she was offered a fairly lucrative private cheffing gig with a family who are dear friends of Esther Kang, also from our season. Friends of that family heard about how fabulous Tracy was, and soon she had top-tier clients all over Los Angeles, including some Hollywood mega-stars. But not only is she resourceful and savvy…she is conscientious and generous. So it was time to give back. 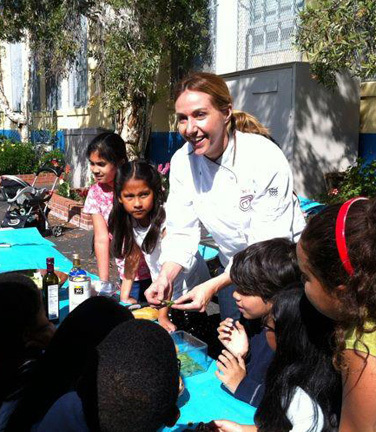 And in October of last year, Tracy formed WILFS: Women In LA Food Scene. (And that acronym is no accident, boys!) It began with 15 members…women Tracy had met in her exploration of the Los Angeles food world. They dedicated themselves to mentoring other women wanting to break into that world, to sharing resources and contacts with each other, to support the local farming and food artisan communities, and to educate others on the importance of where their food comes from. Nine months later, they have almost 80 active members. They meet monthly to break bread, network, share new food discoveries, and discuss and explore a different food-related subject each time. 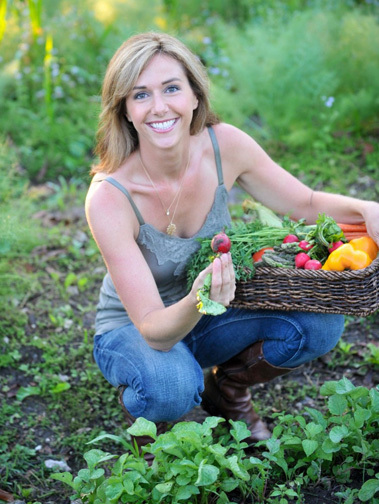 The guest speaker may be a local coffee roaster, a farmer, a chef, a vintner, or a brewmistress. Their last meeting was at the home of a woman who owns an urban farming consultation company, and they planted veggies and learned how to care for backyard chickens. (I’d have LOVED to have been at that meeting!) Tracy beams when she reports that at least 10 new jobs have been created for extraordinary women because of connections from within WILFS. Tracy has also carved out time to join me in my support of YO! House, an outreach program for homeless youth in Hawaii. Many of the nation’s homeless kids (and there are many…it’s an epidemic) prostitute or drug-sell their way to a one-way ticket to Hawaii, because it’s the one place in the country where it’s always warm, and they hear tales of picking fresh fruit from trees on the beach and living the good life. Unfortunately, they land in Honolulu and discover horrible gang violence, the nation’s worst crystal meth problem, and just about the only comforting thing for them is that they don’t shiver at night when they sleep in the park. (At least not from the cold.) YO! House is an extraordinary place where these homeless kids can come and get a medical exam, birth control/STD prevention, take vocational classes or get their GED, have a hot meal, and keep a locker in which to store their few valuables…making them a less likely target for assault and theft by older homeless and gangs. And you’d be deeply troubled to learn about many of these kids. At one event, an 11-year-old limped up to YO! House with blood running down his leg from a “fall” (ie assault). His parents had left him there on a recent vacation. Intentionally. Tracy has joined one of several trips down there, coordinated solely by MasterChef contestants and our amazing friends Dr. Cristy Kessler and Rev. Liz Zivanov, and her amazing flock: the Parish of St. Clement in Honolulu. We’ve been honored to visit with these kids, hear their stories, help inspire them, and most importantly…to cook for them. When I see people who are extraordinarily gifted at making money and being successful, I am impressed. When I see people who are like that, but who spend just as much time and money giving back to others, I am in awe. And Tracy is one of those people. Tracy is an easy person to love. Her smile is bigger and brighter than anyone I’ve ever met. It’s so damn big that when I talk to her on the phone, the western horizon brightens about 10 shades. I haven’t met many people on this earth as extraordinary as Tracy. In the 2 short years since MasterChef turned her life upside down, she has not only been a voice for change in her Los Angeles food community, she has pulled together like-minded ladies to be an even larger force for good. And she has touched many, many lives. Including my own. When people leave a reality TV show, they always say, “You haven’t seen the last of me!” Unfortunately…that’s often not the case. But we most certainly haven’t seen the last of Tracy Kontos. We haven’t even seen the beginning! Follow Tracy on Facebook and Twitter and LinkedIn. Check out her wonderful website, and if you are a woman in the food industry interested in helping WILFS branch out into other cities, get in touch with them through their website! 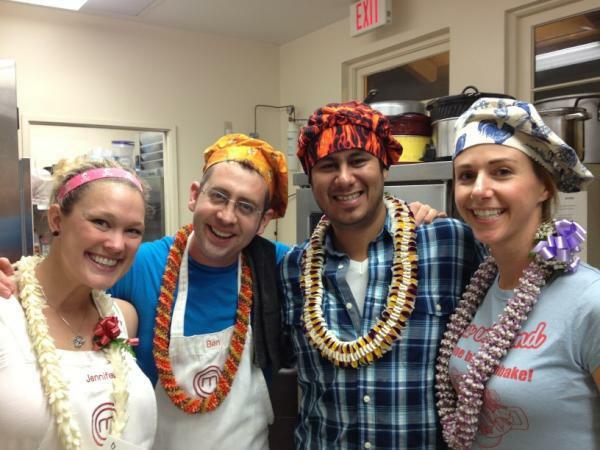 A week ago, I went to Hawaii with Jennifer, Adrien, and Tracy from MasterChef at the invitation of Cristy Kessler. 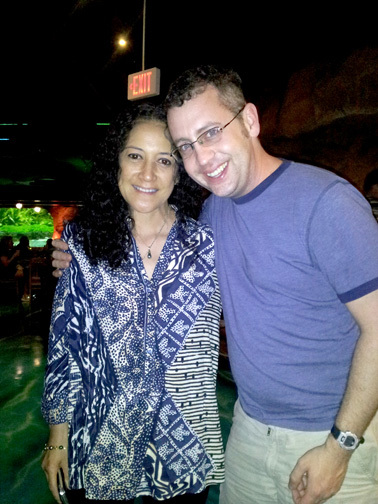 Cristy is an amazing and inspiration woman…her whole life she’s been plagued with serious, normally-fatal illnesses. A mere 6 months ago she was in Turkey for a controversial stem-cell transplant in a last-ditch effort to save her life…now she has normal liver and kidney function for the first time in her life. And even though she still has a weakened immune system and tires very easily, she’s out in her community giving back to those less fortunate. 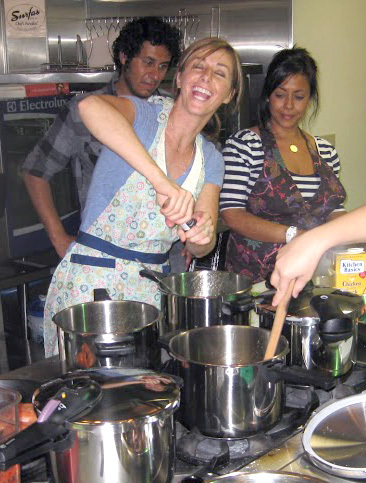 She and her partner Liz watched MasterChef during her recovery period and developed a connection with the 4 of us, so they decided to invite us 4 to Oahu to help serve some very special meals to some charities that they support through the Parish of St. Clement, where Liz is the pastor. I met up with Adrien and Tracy in Los Angeles. 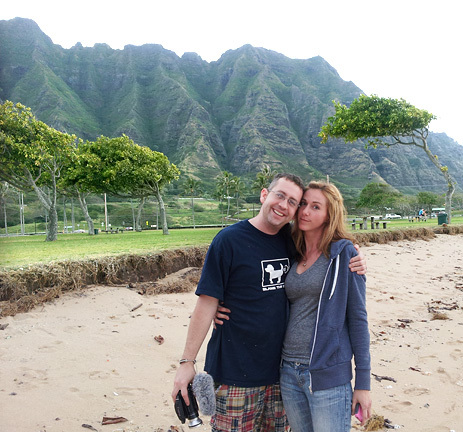 (Jennifer flew a different route from the east coast…11 hours to Hawaii!) Luckily all 3 of us were able to sit in a row together and indulge in some truly spectacular airline cuisine. Upon learning that Tracy was a former flight attendant, the crew kept bringing by complimentary drinks and food. 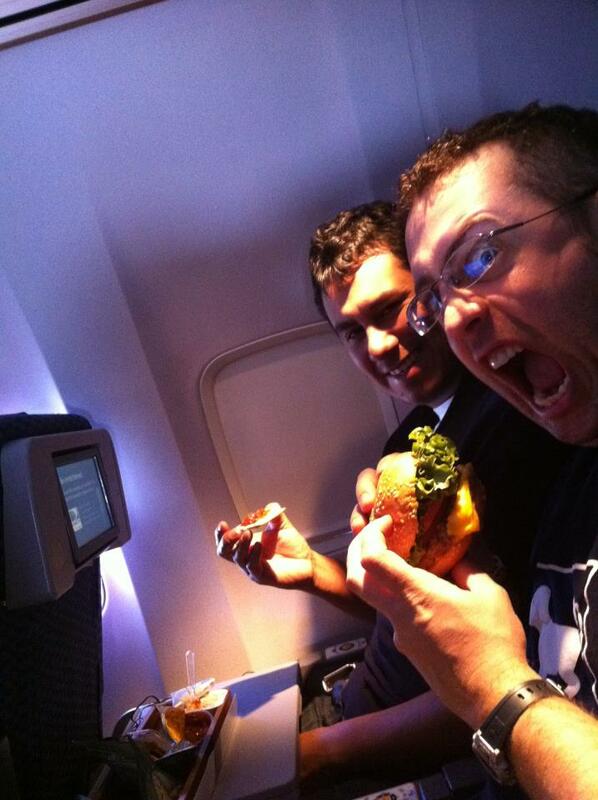 Yes…I actually ate an airplane hamburger. It probably wasn’t made of meat…but it wasn’t terrible, and it didn’t kill me. The 6 hour flight from LA flew by as we caught up on each others’ current activities. Even though Facebook is designed to keep people linked together, we all have SO many fans on our Facebook pages that we easily lose track of each other, so it was really good to reconnect. I hadn’t seen Tracy and Adrien since they stayed at my house this past summer. This was to be everyone’s first trip to Hawaii except for mine. (If you’re a frequent visitor to this site, you know about my obsession with Hawaii and my dream to move there to open a sustainable guest farm.) We landed, picked up the minivan, and headed across the spectacular Ko’olau mountain range toward the eastern side of the North Shore. A generous parishioner at St. Clement had offered us their oceanfront home in Laie for our stay. We met up with Jennifer and Cristy at the house, which was exquisite…perched right on Bathtub Beach where a breakwater built by the ancient Hawaiians forms a glassy tidepool even when the North Shore’s famous winter surf is raging. It was getting late so we immediately undertook the task of preparing dinner. The great thing about the 4 of us (and many of our other dear MasterChef friends) is that we have such synergy in the kitchen together. We each went about our own tasks, crossing over to help others when they needed it, and quickly pulled together a stellar dinner. Adrien made the appetizer, which we termed “guacapoke” or “pokemole.” In Hawaii, one of the most popular foods is poke (pronounced “po-kay” and rampantly mispronounced “po-kee” by haoles “how-lees” which are basically white people.) It’s Hawaii’s version of ceviche…raw fish (often ahi tuna) marinated in lime and sesame, and tossed with onion, crunchy seaweed, and chilis. It’s SO addictive. Adrien’s version incorporated avocado and cilantro, giving birth to a fusion of guacamole and poke…and let me tell you…it was TO DIE FOR! (Over the following 2 weeks I would easily eat my own weight in ahi, it’s so cheap down there, $5-$6 a pound for high grade, and $12 a pound for sashimi grade.) Tracy cooked some NY strip steak along with some mushrooms that made me weak in the knees, and Jennifer put together a mouth-watering coconut rice with garlic and ginger. I provided dessert in the form of a chocolate pie. Was it a cohesive, well-conceptualized menu? Absolutely NOT, Joe Bastianich. Was it an unforgettable meal, eaten on the deck overlooking the dusky coastline of the North Shore? YES! On the way to the grocery store, however, Jennifer spotted a humpback whale breaching offshore, so we had to stop and take a peek. (It was whale migration season in Hawaii, and we saw dozens of them during our stay.) 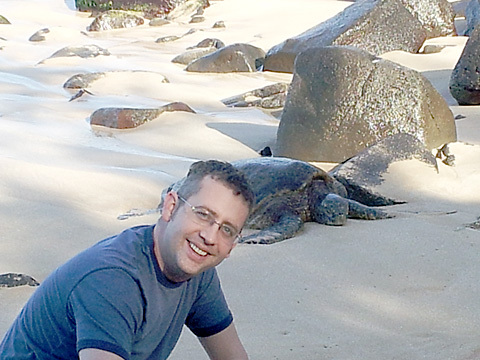 The beach where we stopped offered a double feature…a basking Hawaiian green sea turtle was snoozing on the beach. He was being closely watched by a volunteer, who told us that “Brutus” is 45 years old and this is his favorite beach for a morning nap. We grocery-shopped at Costco and Whole Foods and then hit the commercial kitchen at the Parish to start prepping for dinner. Our guests arrived at 6pm and the family-style dinner was served! Our goal was gourmet and healthy, but recognizable. These people weren’t accustomed to fine dining. So we took island favorites (which often tend to be less-than-healthy) and put our own gourmet yet healthy twist on them. Tracy prepared the appetizer, a macaroni salad. Mac Salad is probably consumed more than any other substance in Hawaii, and at most restaurants and in the home, this just means macaroni tossed with mayonnaise. (GROSS!) Tracy diced up lots of beautiful colorful veggies and did a dressing that was more like a creamy vinaigrette, and one diner actually used the term “Exquisite!” to describe it. There was NONE left. 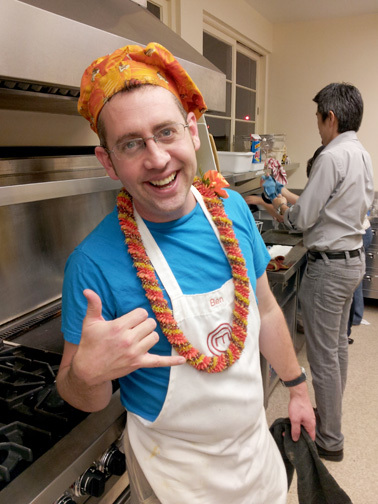 Adrien provided the main course, dark meat chicken with veggies in a pineapple curry sauce. It, too, was devoured, and one very young diner (who is an aspiring chef herself) said that she normally HATES chicken and refuses to eat it, but she ate FIVE HELPINGS of Adrien’s chicken! Jennifer served up her legendary coconut ginger rice, and the Hawaiians, who are accustomed to plain short grain sticky white rice, devoured it as well. (It helped that there were bits of crispy Spam, another island favorite, inside!) ZERO leftovers. As one of our goals was to cram as many vegetables into the meal as possible, my desert was a reiteration of my pumpkin carrot cake, done as cupcakes with cream cheese frosting and candied macadamia nuts. Needless to say, they were popular. The families truly enjoyed the dinner, and we loved playing with the kids afterward. 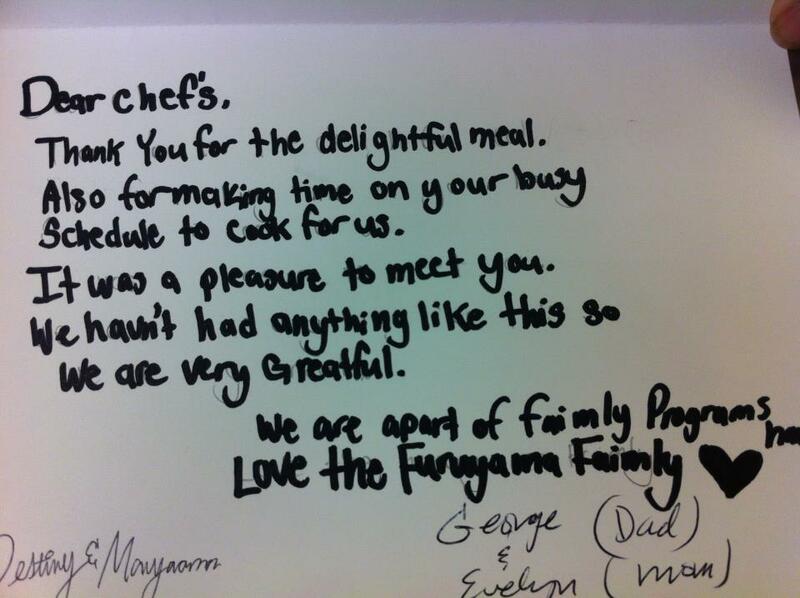 One family handed us a hand-made card that said, “We’ve never had a meal like this before.” We all teared up reading it. To be honest, we were all in our usual happy cooking mode, doing what we loved, and we’d have done it just for the sake of the cooking itself. But seeing how important it was to the people who dined…it was incredibly moving. We take so much for granted in our lives, and these families live on the streets and have no idea when their next meal will come, or they foster many children including their own and have precious little extra money to enjoy dining out. The local news came out to interview us about the event, and we were excited to drum up exposure for the charities…we hope that more people will become aware of them and contribute support. I also had the pleasure of meeting an articulate young woman named Lehua, who had been through the programs as a child and is now about to graduate from college and supports herself with a good job. That’s when you see the REAL fruition of the efforts of these charities. The next day we were up extra-early to prepare the meal for YO! House. In Hawaii, it’s illegal to be homeless if you’re under the age of 18. (It has to do with their truancy laws.) If an officer finds a young homeless person on the streets before 3pm, they’ll be arrested and taken to a juvenile detention program to ensure they are in school. (I later learned from a friend on the Big Island who volunteers with youth that these facilities, called Hale Kipa, are breeding grounds for violence and gangs. However, YO! House is a program of Hale Kipa, and it’s a great one.) So YO! House operates in stealth mode. We had been instructed NOT to Facebook or Tweet ANY details about the event, for fear that the police might show up to arrest all the kids who were coming by to eat. We were all STUNNED by the setup at YO! House. They offer so many services to homeless youth: lockers to keep their valuables in (making them less of an object for assault and theft on the streets), a proper bathroom for showering, a decked-out clothing selection, a computer room which offers classes and GED training, and a medical clinic with on-site doctors and nurses. They provide a hot meal each day after 3pm and try to send the kids off with food for other street friends and future meals. YO! House operates their meal system on a $0 budget. All their food gets donated…which can be challenging when the staff suddenly finds themselves with 50 boxes of cream of wheat, 10 cans of Vienna sausages, and 25 cans of cream of mushroom soup, and have to combine them in such a way that will be yummy and healthy for the kids. It’s the ultimate nightmare Mystery Box! (For the record, Tracy combined the aforementioned ingredients into a sort of “polenta” dish that was actually ridiculously tasty.) We deep fried 2 turkeys for the kids, and served a fresh green salad (which they devoured, to our surprise), a fruit salad (no dressing, and it was also devoured), plus Jennifer’s sneaky mac’n’cheese which incorporated pureed cauliflower and butternut squash in the cheese sauce, so the kids had no idea it was there. More of my cupcakes for dessert. Another young man really connected with Tracy. He was probably 16, and was currently in transition to a foster home. He was strikingly intelligent and told us about how much he loved school and was trying hard to stay in and maintain good grades and a good attendance record. That afternoon he was supposed to attend a registration meeting for the upcoming semester at school, but he’d been instructed to come with an adult. His foster situation wasn’t stable yet and there wasn’t any adult who could accompany him…he was worried he might not be allowed to register unless there was an adult with him. Through her tears Tracy was screaming about the injustice of a child who WANTED to be in school and learn, but that there wasn’t a single adult in his life that could make time to go with him to his school meeting. She wanted to go with him herself, but the policies of YO! House are carefully designed to protect both kids and volunteers, and that wasn’t permitted. It was an incredibly difficult afternoon. I used to volunteer with homeless LGBT youth in Dallas when I was in my early 20s, and at that time I didn’t have the perspective I do now, as an adult. Back then, they seemed just like me, showing up each week, dealing with the same problems I was dealing with. Now when I see these children trying to be their own parents, their own support…having nobody…facing violence and temptation on the streets with no guidance or love…it was just wretched. However, I recognized a BRILLIANT way to help support YO! House in the future…once my farm on the Big Island gets up and running we could easily have a dormitory to house kids who are willing to both work and stay in school…they can work a few hours a week on the farm, get back in school, and have a paying job and a roof over their heads, and a “family” to surround them with love and support. I can’t WAIT to make this a reality. After this very emotional afternoon, Cristy and Liz whisked us off to a dinner at Jimmy Buffet’s Margaritaville in Waikiki. Don’t laugh…the restaurant occupies the space where the incomparable Don Ho performed his legendary show for decades, and Cristy was a very close, intimate friend of Mr. Ho in his later years. So she is well loved at the restaurant. In fact, Don Ho’s wife was there at the restaurant to meet us! It was a great honor to meet Ms. Ho. Her husband is more than an icon. I felt so tiny and unimportant in her presence. And then it was time for another humbling experience. The chef came out from the kitchen to meet us, and he was on cloud nine. “Ben Starr, oh my goodness, I can’t believe you’re in my restaurant, this is CRAZY, I just can’t believe you’re actually here, I’d have you on my line in an instant, you’re such a team player, you’re so creative, you’re so nice, you’re so amazing, I just can’t believe you’re actually here and I’m talking to you, this is unbelievable…” He went on and on like that for awhile. And then I sat down and cried. Why ON EARTH would someone like that be so excited just to meet me?!?! This guy is a REAL chef. (And a VERY talented one, the meal was fabulous.) This guy has WAY more talent and credentials than I ever will. He supports a family. He has cancer. The idea that he would be so excited to meet measly little me just didn’t compute in my brain. It felt very wrong to me. If anything, the roles should be REVERSED. Cristy, who has rapidly become a soul mate of mine, was bawling right along with me and trying to explain that the chef experienced the same kind of connection to us watching MasterChef that she did, and that there was power in that. This was a very gritty, real moment of revelation to me… TRUE celebrities (and I’m wildly far from that, thankfully) have influence. REAL influence. People feel intimately connected to them, though they’ve never met. That power and influence leaves celebrities with a HUGE burden of responsibility on their shoulders, especially when that fan/celebrity relationship manifests in a young person. A celebrity must realize that their actions and words have an impact on many people. That’s not something to treat flippantly. You can’t just live your life on your own terms when you have that kind of responsibility on your shoulders. We got home that night utterly exhausted, emotionally and physically. Thankfully, before us were 2 days of absolutely NOTHING and we’d be free to explore the island and delve into the Hawaiian culture and lifestyle… Check out this video about our trip!